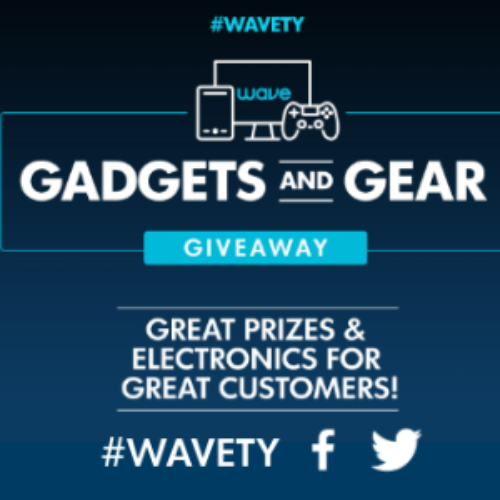 You can enter the Gadgets And Gear Giveaway from Wave Broadband for your chance to win a grand prize of a $1,000 or $500 AMEX Gift Card, a Samsung Galaxy tablet, or a 50″ Toshiba 4K UHD Smart TV. You’ll also have a chance to be a monthly prize winner of a Sonos Beam Soundbar, a Nintendo Switch, a Samsung Chromebook, or an Apple iPad. Weekly winners will receive an Amazon Echo, Ring Cam, JBL Flip 4, FitBit Flex 2 and many more. There will be a total of 40 weekly winners, 6 monthly winners, and 5 grand prize winners! Entry ends April 1, 2019. They weren’t kidding when they named this one the Gadgets and Gear Giveaway. It’s been awhile since I’ve seen a sweeps with such a varied amount of the latest gizmos as prizes. Whether you’re a weekly, monthly, or grand prize winner, you’ll end up that much further into our sci-fi future. That is unless you’re lucky enough to be the winner of one of the AMEX gift cards. Then you can buy all the no-tech and low-tech your heart desires, you troglodyte rebel! There’s a few prizes in this giveaway that interest me. I’ve been toying with the idea of accepting my robotic masters and installing some smart home components to my abode. The Ring Doorbell Cam would be a welcome addition. Then I wouldn’t have to get up to peek out the window every time I hear some kind of kerfuffle erupting out in front of my house or checking every 15 minutes to see if the mail showed up. Of course, I might even be inclined to use it to duck out on the solicitors that show up to sell me vacuums, cookies and religions. I’m pretty surprised there are still door-to-door sales in the era we live in. Not only does it seem unsafe, but it always makes me wonder, have these people never heard of the internet? Jokes aside, I also have to wonder if they really promote physical fitness or if they actually detract from it. There’s nothing quite like having a device on your wrist that tells you what a lazy, sedimentary sloth you are to sideline your self-esteem. I wonder if anyone has ever just gone down a spiral of self-aggrandizing behavior as their wrist keeps pointing out their negative habits. Also, how many people who would potentially get out in the fresh air for activity are otherwise sated by the knowledge that their trip to the grocery store completed their step count. Maybe it’s just me, but I’m just not 100% sold. As usual I’m 5 paragraphs deep in ramblings and yet no closer to getting to any discernible point. So I’ll just wrap this one up by saying that I wish the best of luck to all my fans and subscribers! Let me know in the comments section below what your opinion is of exercise monitors like FitBit. Do you have one? Is it helping you be more active? Did you stick to the routine for a few days and then let it go the way of so many home exercise machines, collecting dust and clogging up the living room? Tell me your take, or tell me to take a hike! Either way, I can’t wait to hear from you. Winning the Amex card would be awsome!! I would like to enter to win a $1K AMEX Gift Card, Samsung Galaxy, Toshiba 50″ UHD TV & More.